Kate McCann, unaware it was the same cleaner in their apartment the day of their arrival , April 28th, who took charge of a delivery for TWO cots , the same cleaner who saw Wednesday May 2nd , the cots had been seperated, placed now in different rooms, one with the parents, the other in the room it is alleged Madeleine had used . The McCanns when made arguidos realized from questions being asked of them that the maid had given the police a witness statement . Kate lied and tried to explain there were three cots...as I have already stated the parents were oblivious to the fact that the very same cleaner took delivery of only TWO cots. Such a little slip-up but IT proved beyond doubt ALL of the Tapas 9 had lied. 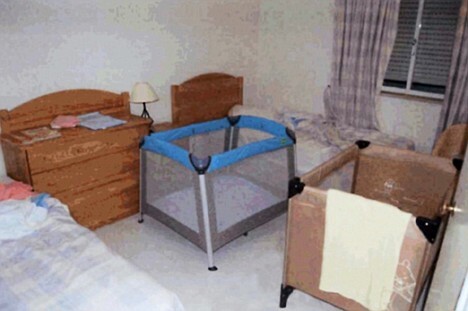 By May 3rd , the McCanns had placed both cots together and staged their own childs abduction. 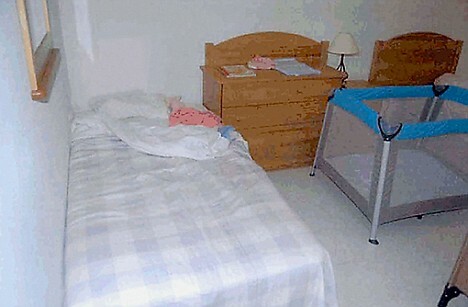 Kate McCann, by her own admission in her May 4th statement clearly states there were TWO cots. BUT by the time Kate became an ARGUIDA she had added a THIRD cot to try and confuse the maid's testimony. She remembers that when preparing this apartment, she had just been notified that the apartment was to be occupied by 5 (five) people; she was unaware of children in the group. However, at the exact moment when she and her colleague DTNA were preparing the room, personnel from the company MARK WARNER entered the apartment and proceeded to place TWO children's beds.